A few years ago, I tried an experiment where I made sure not to check social media before starting the blog each morning. And nobody should start the day with angry blood. I don’t mind them not voting. I figure the vote of a stupid person is a coin toss anyway, and the fewer random objects flying around, the better. And I suppose that old thing about “opening your mouth and removing all doubt” is harmless enough when these geniuses are only recruiting other fools to their cause. In fact, it might be a benefit. I’ll even admit that, a half century ago, the choice between Hubert Humphrey and Richard Nixon seemed like no choice at all. Except that Humphrey was, in fact, not a crook, nor had he torpedoed the Paris Peace Talks to make sure the war lasted past Election Day. But a lot of that was behind the scenes when ballots were cast, and, besides, the 26th Amendment had not yet passed in 1968, and so I was not old enough to vote. You’re likely to outgrow naivete, but, if you don’t, it tends to harden into downright incurable stupidity. It’s just not that complex this year. 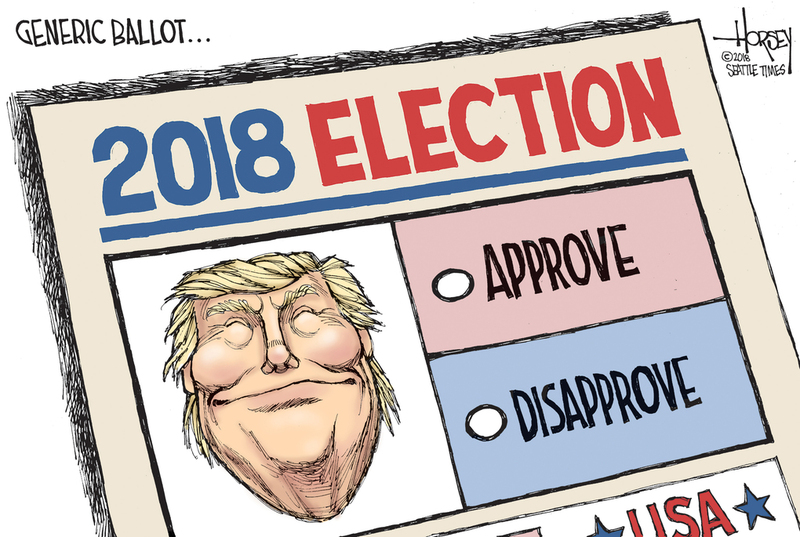 As David Horsey points out, we’re basically voting yes or no on one issue. However you feel about local Candidate A versus local Candidate B, this election is about the balance of power and whether the President should have both houses of Congress in his hip pocket. Whether this President, that is, should have both houses of Congress so clearly and completely in his hip pocket. 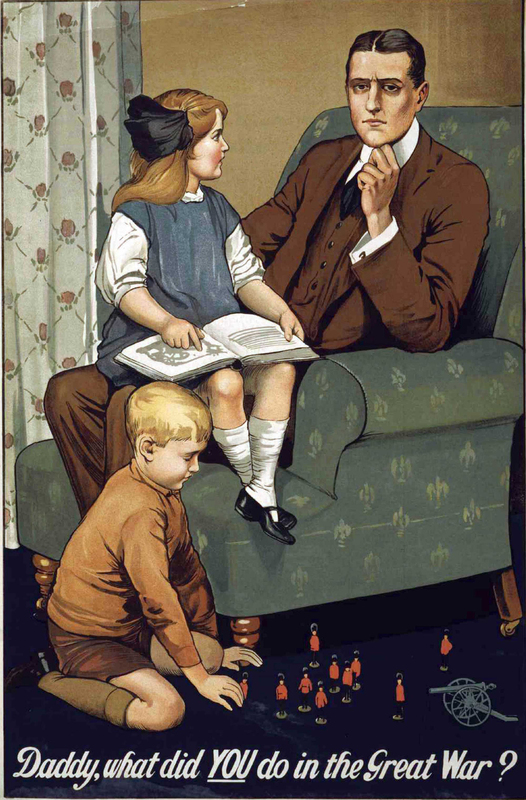 In that WWI poster, the man was guilty of having not enlisted, of having done nothing. But voting involves a lot less risk than joining the army, and when you can see the damage already done, it seems a small gesture in the service of the future. And thus a much greater failure of character if you don’t make the effort. The good thing about the WWI poster is that, contrary to the toxic, divisive technique Pat Bagley criticizes here, it doesn’t rely on twisting the role of the uninvolved voter. It simply asks the question, and lets the little girl’s innocence drive the point home. The day will come when having been uninvolved will be accusation enough. We’ve already built camps for children and now we’re talking about concentration camps for entire families. This is no longer theoretical or an issue of exaggeration. Still, history suggests that a genuinely significant number of people just sit back and watch. 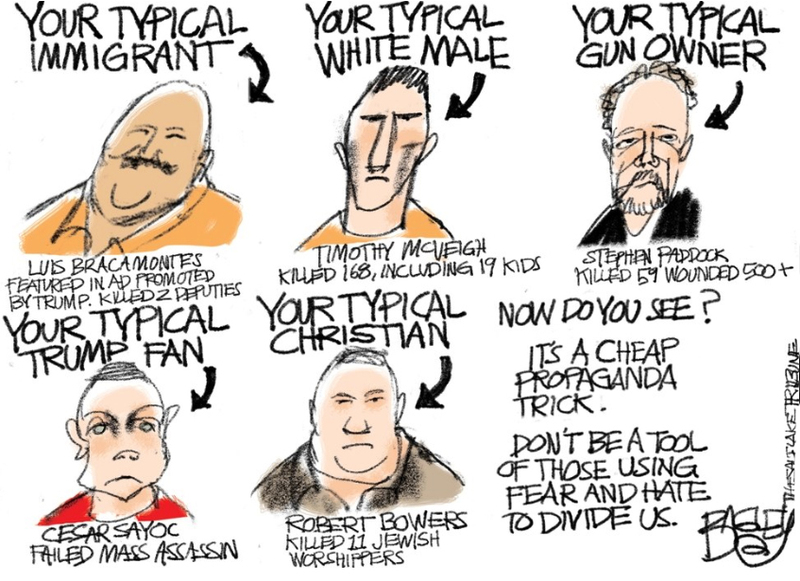 It’s almost easier to forgive the Trump faithful who believe his steady torrent of lies, distortions and nonsense, than it is to forgive those who know better but who do nothing. For example, how many people know that the immigrant caravan is miles and miles and miles away, and is made up of poor families fleeing terror in their own countries? It may be foolish and gullible to believe that it is nearly here, that it includes gang members and even ISIS operatives, that it was funded by an international conspiracy, but I’m willing to cut the useful idiots a break. I’m not as willing to forgive those who know, and who yet do nothing. I remember when Klaus Barbie stood trial in France in 1971, and, specifically, I remember that it was an event that tore the mask off the gentle myth that the entire French nation had been enrolled in the Resistance. 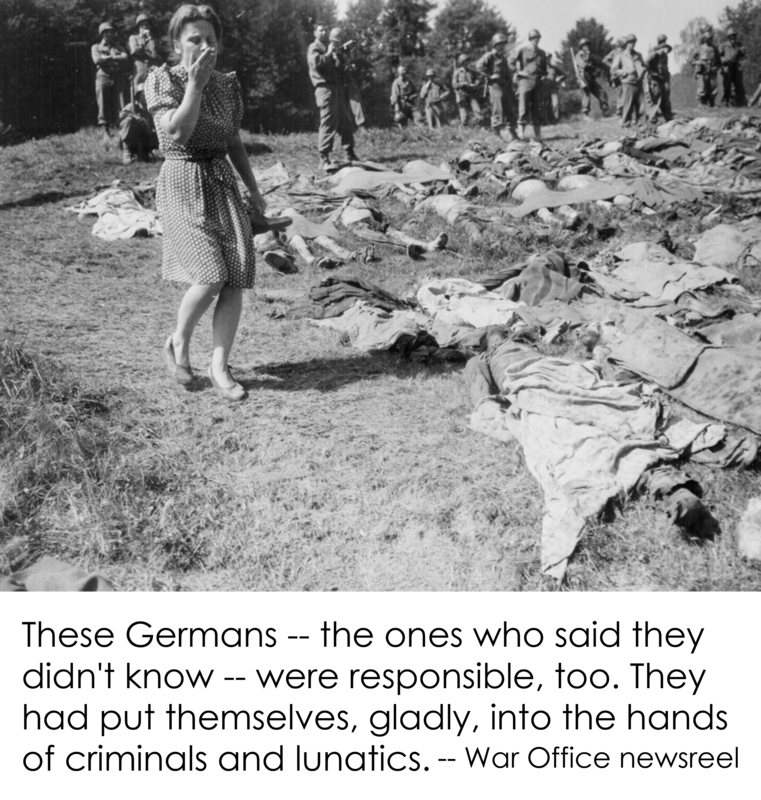 Between the vast majority of Germans who didn’t know and the vast majority of French who actively fought against the Nazis, it’s amazing that Hitler made any headway at all, isn’t it? It may have been easier then to feign ignorance, or innocence. It was certainly easier during our own Revolution, when people hung back and stayed out, even when both Tories and Patriots were being lynched. In any case, it’s awfully hard, today, to preserve the public’s right not to know. 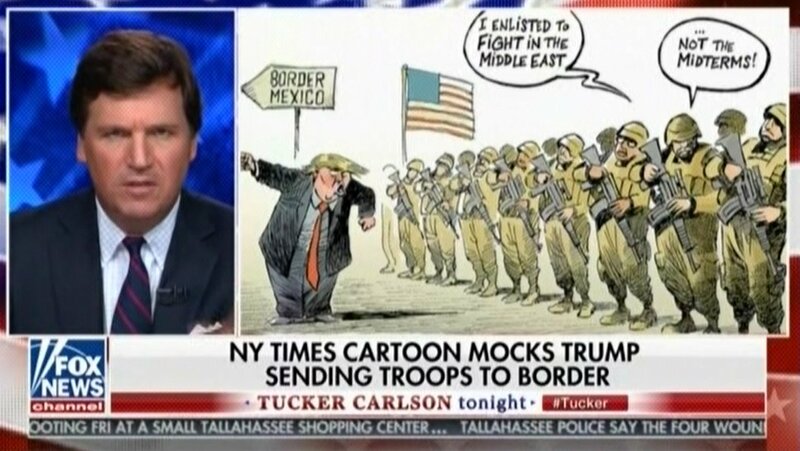 Granted, we now have a propaganda arm for the rightwing, which helps legitimatize the dishonesty, bigotry and divisiveness, as this promo for Tucker Carlson’s critique of Patrick Chappatte‘s cartoon indicates. 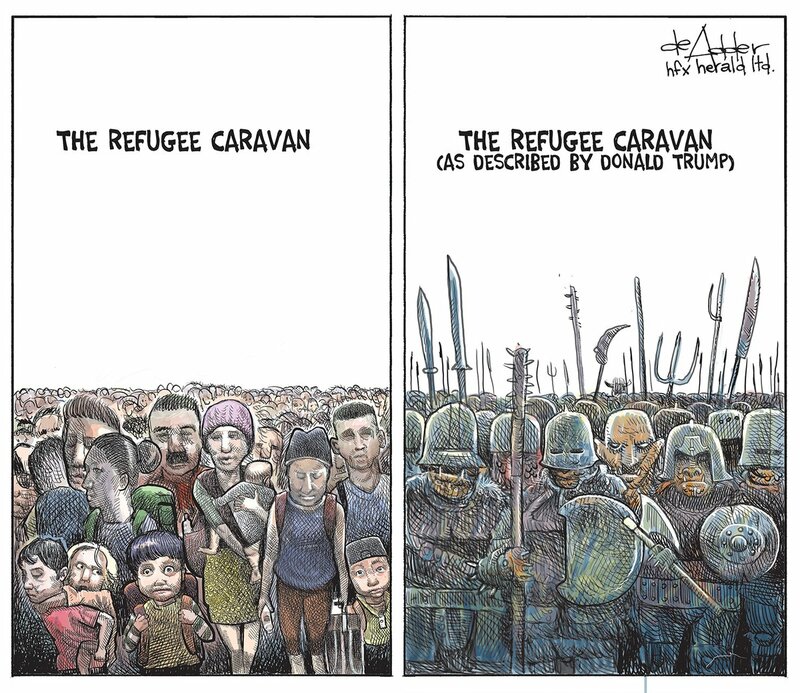 Michael de Adder illustrates the divide between those who can absorb and understand the news, and those who live in a state of constant, unwarranted, ignorant fear. Perhaps you need distance to get a clear look. 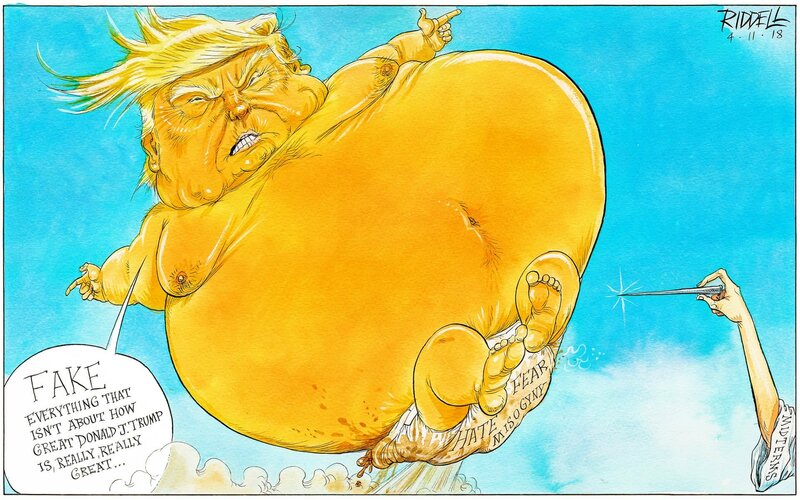 De Adder views us from Canada, while Chris Riddell has the perspective of a seat in Britain, and I sure do hope that needle strikes home. And then we’ll hope the questions don’t become more probing, and the answers more troubling. Voter turnout will tell us nearly as much as the results themselves. Meanwhile, we don’t need any more lectures from the geniuses who can see through it all. Been there, done that, and here we are again. Considering the way we ended up, and the way Canada ended up, I am not sure that the American Revolution was a great idea. 29 queries in 0.221 seconds.